Discovered by H. Nishimura, Kakegawa, Shizuoka-ken, Japan, with on 10-s exposure on three frames using Canon EOS 6D digital camera + f/3.2 200-mm lens under the limiting mag = 12s, who writes that nothing is visible at this location on a frame taken on 2018 Jan. 15.872 UT." Anyone tried to observe with BSM at Hawai (Mike Linnolt's site)? Unfortunately, BSM_Hamren can only observe to the west, and so cannot pick up this early morning target. It is also a very crowded field and faint for the southern BSMs like BSM_S or BSM_Berry, so I hope that you are successful with T13! It was realy an adventure! Then tried again later, but it said that position was not accessible from the observatory. Then I checked T17, but the telescope was either in use by someone else or the that position was not accessible from the observatory. Finally after ~20-25 minutes trial and error with the 51cm big T31 I got a positive response! The good side of this adventure that with T31 I was able to use V filter. I am gonna try it from ROAD in Chile. Astrometry and photometry will be done later. 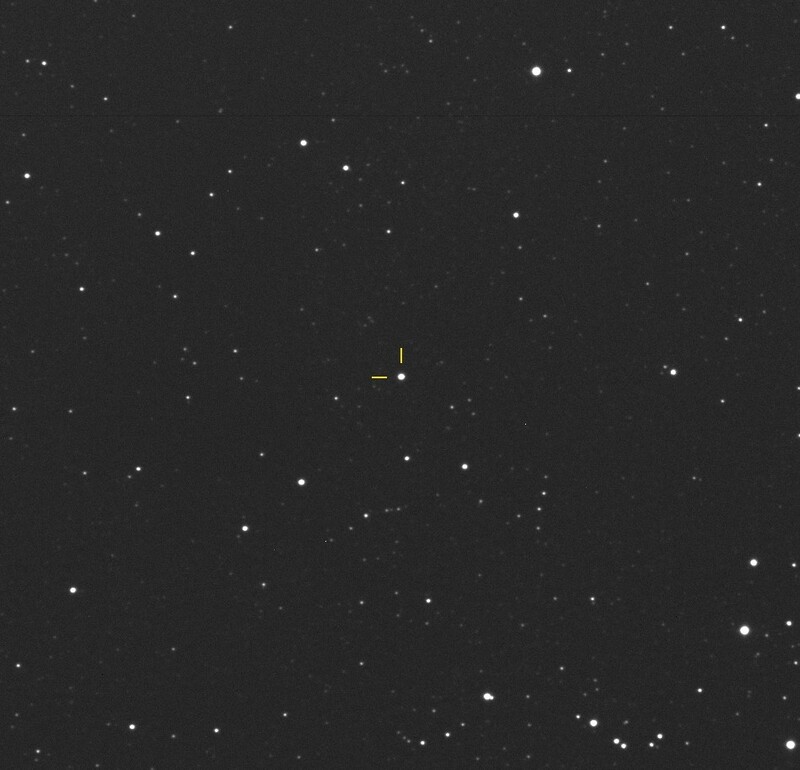 The brightness PNV J17180658-3204279 on 2018 01 18.7479UT was 10.722V (0.042) - ensemble photometry of 2x30s CCD images made by Robert Fidrich, Hungary using the 0.51m T31 telescope of iTelescope network at Siding Spring, Australia. The photometry was calibrated using APASS V data usin UCAC4 catalogue. Estimated accuracy of the plate solution: 0.25"
The closest Gaia DR1 source is 2.9" away (position end figures 06.24s, 25.4"; G= 18.07 mag). The VISTA variable VVV J171806.41-320427.16 (position end figures 06.41s, 27.2"; 18 mag in infrared) is only 0.8" away. There is a new sequence for this star. It would be good if someone could make photometry with B and V filter in order to determine the color of the PNV. Observations with longer focus would probably be helpful. Maybe you also need to check for fainter companions within 20". The new sequence stars BMN-632 (Ref) and BMN-634 (check) are used. AAVSO Alert Notice 612 announces and reports on Nova Sco 2018 = PNV J17180658-3204279. Please see the notice for details and observing instructions.